Successfully Added Ulefone Armor X Rugged Smartphone - 6739 CPU, 2GB RAM, 4G, IP68, 5.5 Inch Screen, 720 x 1440, 5500mAh to your Shopping Cart. IP68 protection and solid build protect the Ulefone Armor X from drops, water, and dirt. Powered by MediaTek 6739 CPU and 2GB of RAM for a reliable performance. 5500mAh battery has enough juice for a day's worth of usage. 5 Inch Full HD screen protected by Corning Gorilla Glass for greater protection. The Uefone X has all the requirements for a great rugged phone. The solid built and IP68 conformity ensures its protected from water and dust ingress while the good hardware gives it a powerful performance punch. The industrial design with tough rubber bumpers show off the phones rugged pedigree and make it clear that this is a serious outdoor smartphone. It has been designed to take a beating, get thrown around and be submerged in water without any problems - in that it delivers in spades. This phone can accompany you through the worst storms and can survive drops from 1.5 meters. It can withstand 1 hour submerged in water and is the sort of phone that adventures and outdoor workers can rely on. A 5.5-inch display delivers full HD resolutions and brings good viewing angles. With a high level of brightness and good contrast, this screen works well even in sunlight. A Corning Gorilla Glass 3 coating protects the screen from abrasions and knocks and ensures you will be enjoying the viewing experience without unsightly scratches marks or cracks on the display. Powered by a MediaTek 6739 CPU and 2GB of RAM the Ulefone Armor 2x delivers a very competent performance. The Phone runs on the Android 7.0 OS and delivers a smooth user experience that's fairly respectable. With 16GB of storage, it has space for all your apps, games and media but should you require more the micro SD slot lets you extend the storage by up to 32GB. A 5500mAh battery brings plenty of juice so you can enjoy a day of typical usage without needing to recharge. AS this Phone has a type-C USB port you can enjoy good charging times when the battery needs topping up. 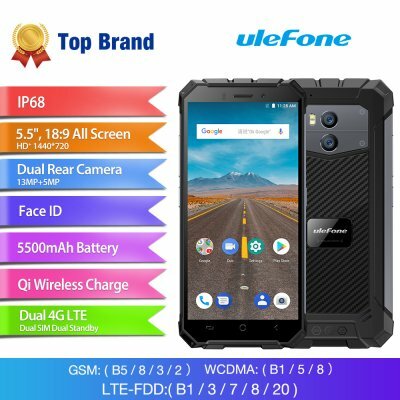 The Ulefone Armor x rugged phone comes with a 12 months warranty, brought to you by the leader in electronic devices as well as wholesale rugged smartphones..